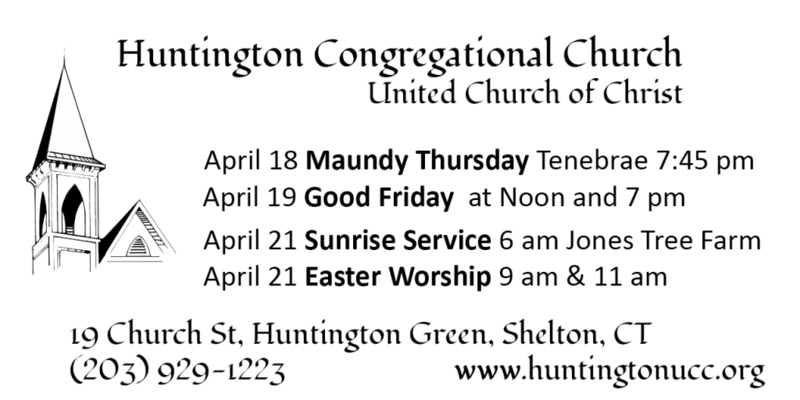 Welcome to Huntington Congregational Church United Church of Christ! Worship is at 9:30 Sunday mornings. Your seat is waiting! Huntington Congregational Church, United Church of Christ is called to spread the love and light of God like a beacon into the community and the world. We seek to embody Jesus’ great commandment to love God, and our neighbors as ourselves (Luke 10:25-27). In keeping with this calling, we, the members of Huntington Congregational Church, United Church of Christ, declare ourselves as “Everybody’s Church”. We welcome and affirm all persons of every race, age, gender, marital status, physical or mental ability, socio-economic status, nationality, life history, faith background, and sexual orientation or gender expression or identity into the full life and ministry of this community of faith, including membership and leadership. We welcome and embrace the God-given gifts that each person brings to the life of our congregation. We invite and welcome new members to become active in our church family. For more information, please contact Rev. Lucille L. Fritz at 203-929-1223.